Ms Sumalatha maintained that she did not have faith in the Karnataka police. 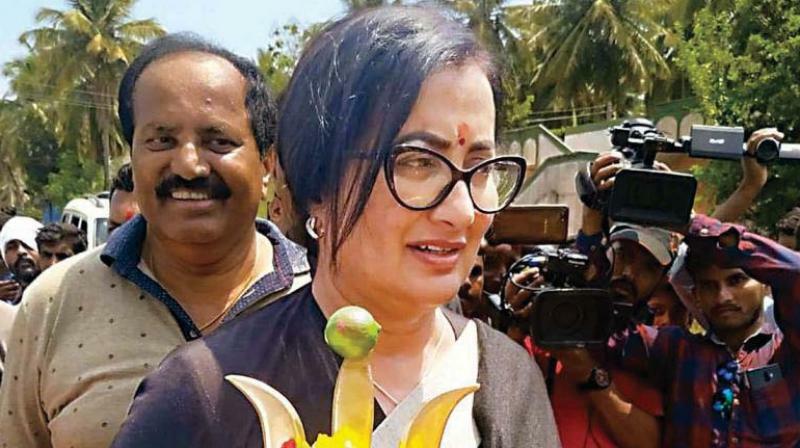 Mandya: Ms Sumalatha Ambareesh who is contesting as an independent from Mandya, said on Friday that she would file a complaint with the Election Commission against Chief Minister H.D. Kumaraswamy for accusing her of engineering the stone pelting at her rallies. "Mr Kumaraswamy's statement is very provocative and speaks of a hidden threat to my life, Abhishek Gowda and stars, Darshan Tugudeepa and Yash. The JD(S) leaders are ready to go to any extent to harm us. So, I have decided to file a complaint against the CM with the Election Commission and seek CRPF protection for my family and the actors,” she said.